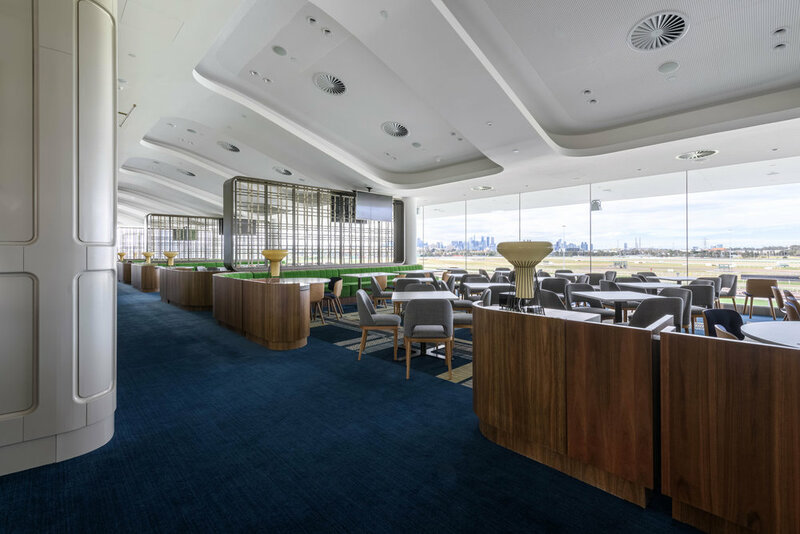 The Members Dining Room provides sweeping views of the track across to the city, sitting proudly on the second tier. The design of the room pays homage to racing heritage of the club, inspired by, and starring, the club’s spectacular art collection. The carpet’s natural palette picks up the moss greens of the turf, and the blues of the sky in each equine portrait. So, with the incredible panoramic view adjacent, the carpeting becomes the feature that connects the room to its context. The contemporary geometric ribbon design amidst the dining tables unifies each section, and the deep blue corridor provides a regal and traditional style entrance.